Located off Fairway (ST16 3TL), the pitch measures 94x64m and can be used for full scale matches, or divided into three smaller pitches for small sided games, tournaments or training. The artificial pitches are available to hire or you can find details on our Facebook page. 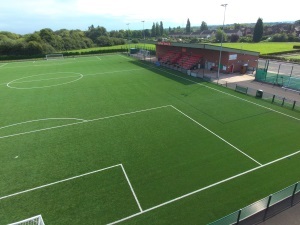 The state of the art floodlit 3G pitch is located off Fairway with plenty of free onsite parking. Onsite refreshment facility serving hot and cold food and drink. Fantastic spectator facilities including large grandstand with excellent views of the pitch. On site supervision providing excellent customer service.